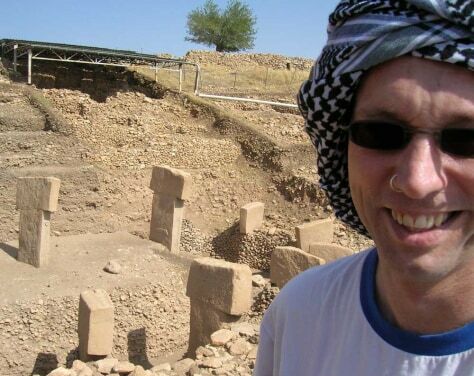 Gobekli Tepe is in southern Turkey near the modern-day city of Urfa. It contains at least 20 stone rings (circles within a circle) that date back more than 11,000 years. T-shaped limestone blocks line the circles and reliefs are carved on them. Long ago, people would fill in the outer circle with debris before building a new circle within. Professor Tristan Carter is shown in this photo alongside one of the rings.